March 25, 2019 — Alternative rock quartet Papa Roach launch the official music video for “Elevate,” taken from their latest album Who Do You Trust? via E7M (Eleven Seven Music) which is available HERE. With over 10 million streams globally, the song currently sits in the Top 15 Active Rock U.S. radio chart. Having just completed a successful, SOLD OUT tour with Shinedown and Asking Alexandria in the U.S, Papa Roach have just added seven new dates to their summer U.S. tour in August, featuring guests Asking Alexandria and labelmates Bad Wolves. New dates are in bold in full routing below. The band kick off the UK leg of their headlining Who Do You Trust? tour on April 13th in Southampton. 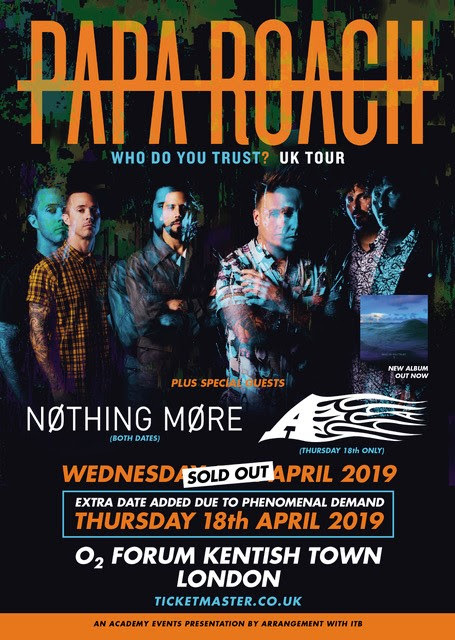 The London O2 Forum show on 17th April is sold out, and as supporters of new upcoming bands, Papa Roach have also added Manchester’s Hot Milk to that date. Due to huge demand they have added a second London show on 18th April. In addition to Nothing More, who are support for the whole tour, British rock band A have been added as special guests for this extra date. Tickets are on sale HERE. The band continue with a string of festival dates (May-June), then head home for their WHO DO YOU TRUST? USA SUMMER HEADLINE TOUR in Dallas on July 27 through to Las Vegas on September 1. The headline tour will feature an all-new production inspired by their tenth studio album, Who Do You Trust? (Eleven Seven Music). For tickets and more information, visitwww.paparoach.com. *Newly added dates in bold.